As the Canadian organic market grows, so too does demand for good data. A series of reports by the Canada Organic Trade Association (COTA) – commissioned by the Prairie Organic Grain Initiative – provides insights on the organic markets of each Prairie province. 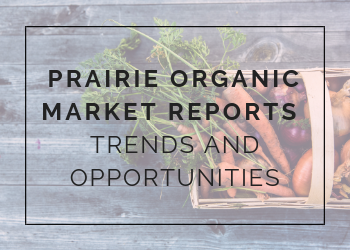 These in-depth reports include a profile of organic shoppers, an analysis of organic market growth and organic imports, as well as opportunities for growth across the Prairie provinces. This is the second provincial report for Alberta (first was released in 2013) and the first report for Manitoba and Saskatchewan. “We know that the demand for organic products in the Prairies is growing substantially year over year, but now we have the statistics, the demographics and the purchasing trends that help us really track and understand that growth. This report gives us in depth knowledge into who, but also where and what organic consumers are purchasing in the prairies.” Becky Lipton, Program Director, Prairie Organic Grain Initiative. The percentage of Prairie grocery shoppers that purchased organic products grew between 2016 and 2017. Saskatchewan and Manitoba grew from 58% to 62% and Alberta grew from 67% to 74%. More Albertan’s buy organic products on a weekly basis than any other province. From 2012 to 2017, the Prairie provinces saw an increase in the percentage of consumers purchasing organic products from mass retailers. Furthermore, Saskatchewan and Manitoba saw an increase in organic products purchased at regular grocery stores (61% to 78%) while Alberta saw a decrease (82% to 76%). Similar to national trends, fruits and vegetable purchases in the Prairies were the largest organic category whereas, Prairie organic dairy purchases were the lowest in the country. Personal health reasons were found to be the top two motivations for purchasing organics in the Prairies. This included the consumer’s desire to avoid highly processed foods and artificial ingredients as well as the absence of harmful pesticides or other chemicals in organic food. Together, Manitoba and Saskatchewan accounted for approximately 5% of organic grocery sales nationwide while Alberta accounted for approximately 15% in 2017. Imported organic products have had a year-over-year growth rate of 14.6% in the Prairies from 2012 to 2017. Alberta the highest growth at 16.7%, with Saskatchewan trailing behind at 5.4%, and Manitoba at 3%. The United States accounts for 51% of Canada’s organic imports and 12% of exports. Each report was produced with data from an online consumer research study using the Ipsos i-Say panel, as well as data from Nielsen Company and Statistics Canada. The Canada Organic Trade Association conducted secondary research and analysis with additional insight from leading organic experts.